Once again this coming February First Thursday we shall once again have our door wide open and our art on show for all to explore (we don’t do locked-door-ring-the-bell-intimidation at Cultivate). Our current guests are the twin creative force that is QUIET BRITISH ACCENT with their clever take on popular culture and their fusing of music, football, textiles and type (we originally found them via a football fanzine), and BEN NAZ, a street flavoured artist we’re particularly pleased to have back in the gallery after the traumatic year he had last year (for those of you who don’t know Ben had a rather tough year battling cancer, it was touch and go for a bit and we were genuinely delighted to see him walk through the door with an arm full of new work and a smile on his face this week). The eight in house CULTIVATE EVOVLED artists are JULIA MADDISON, SEAN WORRALL, GARETH MORGAN, EMMA HARVEY, GENEVIEVE H-B, JESSICA BALLANTYNE, KATRINE STOREBO and CHRIS PAUL GODBER, we’ve been evolving our individual wall spaces since the start of the year. 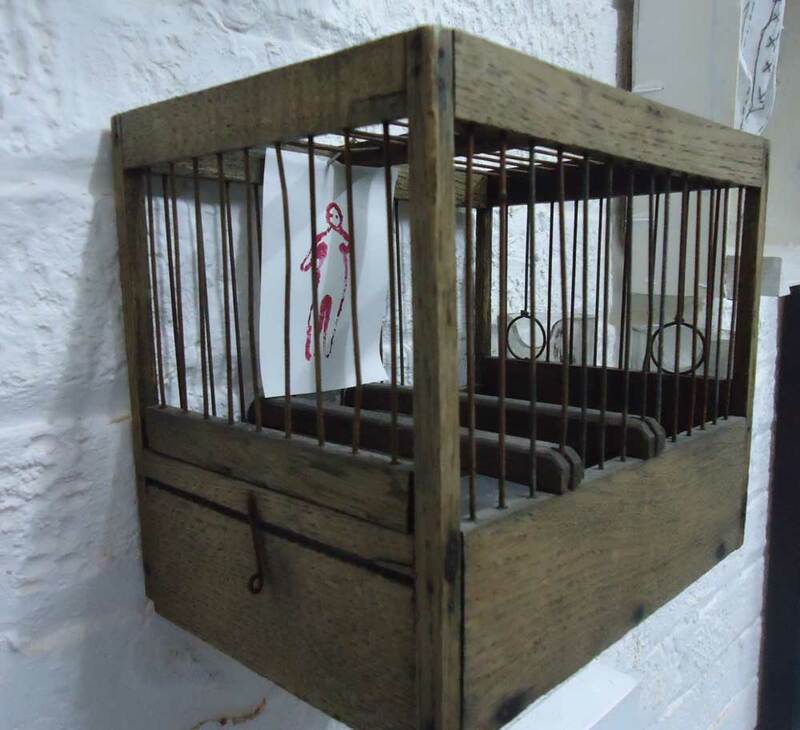 Eight artists united in terms of sharing a space and something near a philosophy in terms of using the space and creating within it, eight rather different artists though – we deliberately pull together a not so obvious group of creative working artists. 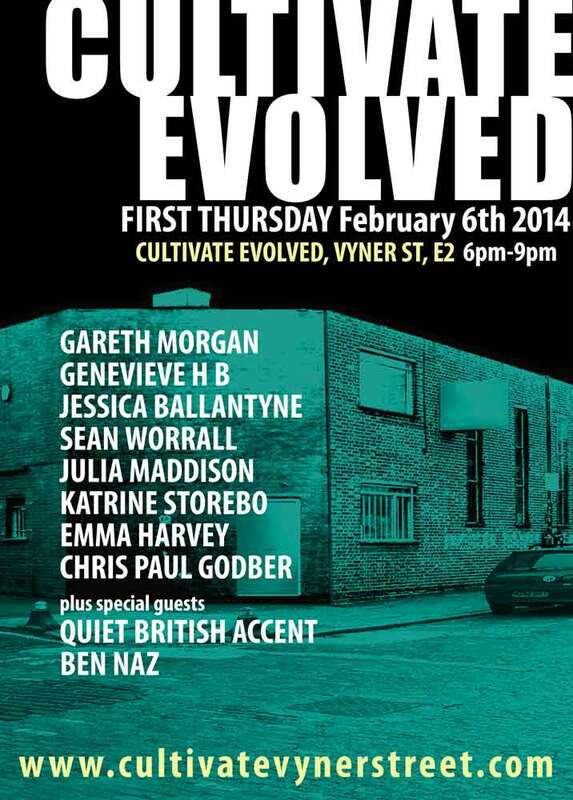 Cultivate Evolved will be open from 6pm until things come to a conclusion (officially 9pm, in reality, closer to midnight) this coming First Thursday evening, Thursday Feb 6th. 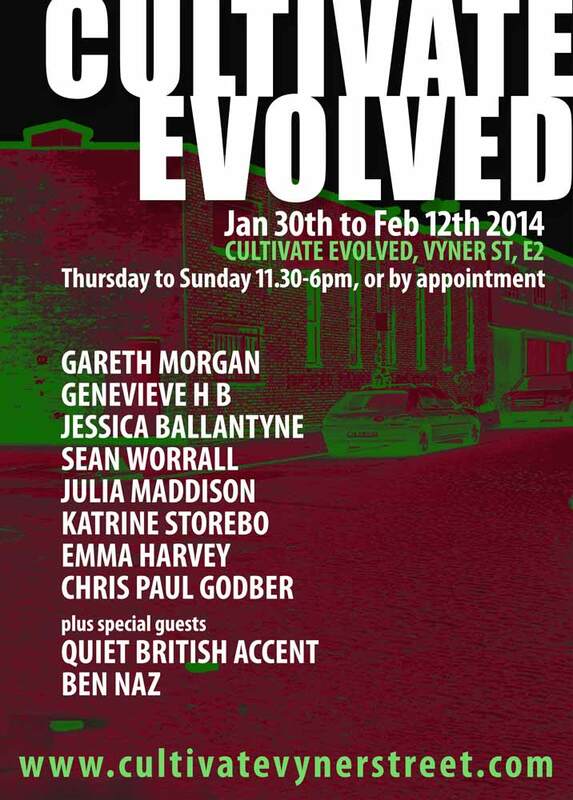 Cultivate Evolved is open every Thursday to Sunday, 11.30am to 6pm and at all other times by appointment. We expect things to be happening at most of the other galleries and spaces in and around the street this month, including LIMEWHARF, HADA CONTEMPORARY, 47 GALLERY, WAYWARD. WILKINSON, VYNER STUDIO and who knows who else…. ← A month and a bit in, some thoughts on the evolution of Cultivate and things….